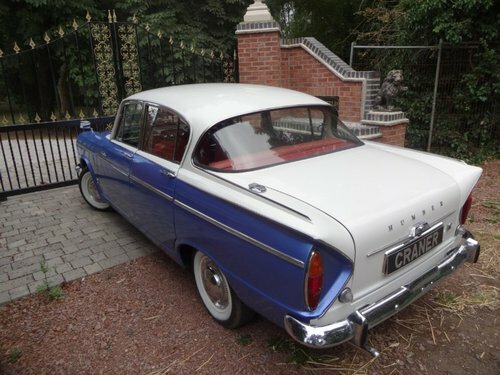 Here we have this very attractive mark 2 Humber Sceptre in its lovely colour combination blue and apple white. 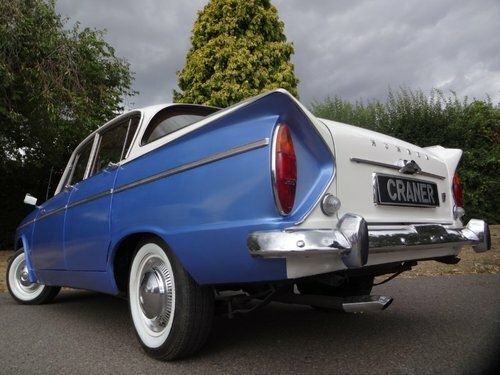 Containing a very large history file of mot's all corresponding with very little mileage containing each year please see photos at Craner Classic Cars Website. This is a very attractive car indeed with striking colours and red interior. 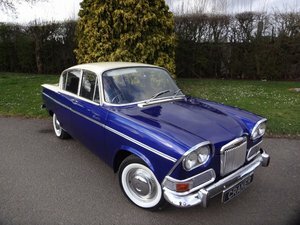 The Humber Sceptre was introduced in 1963, two years after the Hillman super minx on which it was based, Also sharing much in common with the Singer Vogue, the Sceptre differed from these cars in that Rootes designers gave it a different roof and different rear bodywork, giving the car a sleeker look than its stablemates. 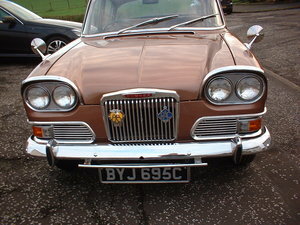 Originally this design had been intended to replace the sunbeam Rapier, hence the rather more sporty appearance than previous Humbers, Humber being the most luxuries marque within the rootes group, the Sceptre was well equipped and stylish, featuring front disc brakes and overdrive and a full complement of instruments power came from a 1.6 litre four-cylinder engine producing 80bhp. 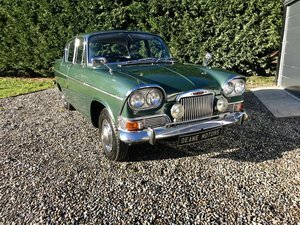 ORIGNS OF THE HUMBER MOTOR CARS: In order to trace the development of the Humber motor car it is necessary to go back to the 1887 when Thomas Humber formed a partnership with the prominent 19th century financier, Harry j. Lawson. In subsequent year Lawson appears to have largely taken over day-to-day running of the Humber compony, and it was under his auspices that the first moves towards motor car production were made. He had set up the British Motor Syndicate with the aim of buying up as many existing and future patents as possible relating to motor manufacturing – both in this country and, to a lesser extent, abroad. Patented innovations concerning the new ‘science’ of motor engineering were numerous at this time, and it was the British Motor Syndicates desire to gain a monopoly in what Lawson saw as the next big growth industry. New Humber Sceptre: The exciting sports performance is now further improved by a new powerful I725cc engine – with overdrive as standard or fully-automatic transmission as an extra. Superbly equipped and elegantly styled, the new Humber Sceptre has a roomy interior with luxurious seating, wide and deep all-around vision, front disc brakes, masterly road-holding and ride many new features. These include smart new frontal styling and interior trim, new driving refinements and travel amenities. This is a prestige car of quality, finely-engineered, reliable and economical – magnificent value. Powerful new I725cc o.h.v engine of high precision and modern square design, with five-bearing crankshaft for smooth quiet running. Incorporates the most advanced features. Gives smoother power with fuel economy improved and more flexible sports performance. Elegant sports styling with new frontal design. Luxurious interior, beautifully appointed. Smart new trim, new amenities. Spacious seating, contoured for comfort. Independently adjustable front seats, fully reclining. Front disc brakes, servo-assited braking, self adjusting rear brakes (new). Four-speed all-synchromesh gearbox for smooth changes. Diaphragm clutch – minimum pedal effort. Full range of instruments with clear, new vertical markings, stylish console panel. Adjustable steering wheel – 2 1/2 in. Telescopic adjustment. Rall-type controles. Efficient suspension system – firm road-handling, smooth ride. Dual headlights, now more powerful. Amber flashers. Wide-opening doors and childproof locks. Built-in heating and ventilation, standard. Wrap-over front screen, wrapped-round rear screen, for maximum visibility. Front no-draught ventilators with new automatic locks. Padded grab rail, facia and sun visors for safety. Hand grips above rear doors, with sliding coat-hooks (new). Capacious luggage Compartment – now with automatic light. High-efficiency steering unit for precision control. Alternator instead of dynamo, for higher charging rate (new). Strong unitary construction for all-round safety. Minimum maintenance – no greasing points. New choice of colours and trim. Overdrive on top and third gears – standard. Fully-automatic transmission as an extra. 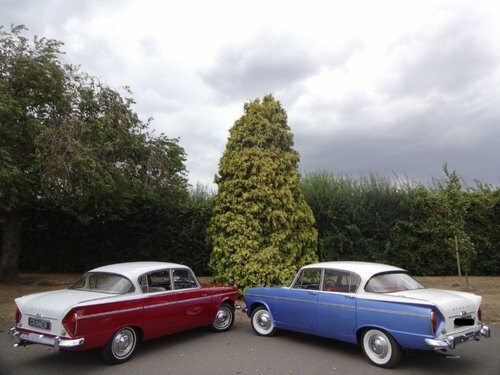 Humber fine enginering and reliability. 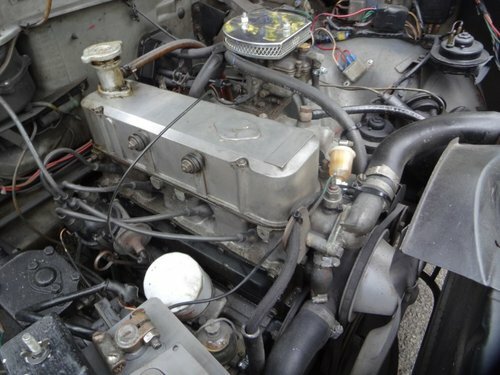 ENGINE: Four cylinder, five-bearing crankshaft unit with aluminium cylinder head and push rod operated overhead valves incorporating large diameter valves. Solex compound carburettor with twin choke characteristics. Light alloy induction manifold. Bore and stroke: 3.21 x 3.25in. (81.5mm. x 82.55mm). Cubic capacity: 105.2cu in. (1,725c.c). Engine develops maximum b.h.p. 91 at 5,500 r.p.m. Maximum torque:105.9lb. ft. at 3,500 r.p.m. Compression ratio: 9.2 : 1. IGNITION: coil and distributor, automatic advance and retard, and vacuum control. Champion N9Y sparking plugs. COOLING SYSTEM: Centrifugal pump and four-bladed fan. Specail selective cooling by jets on hottest parts. Thermostatic for a quick warm-up. CLUTCH:7 1/2 in. Borg and beck diaphargm strap drive clutch. Hydraulic operation from pendant pedal. GEARBOX; Proved four-speed gearbox control ring synchromesh on all forword gears, and centre-floor gear change lever. Laycock-de Normanville overdrive standard equipment on top and third. REAR AXLE: Semi-floating design with hypoid final, ratio 4.22 : 1. Overall ratios: Overdrive top 2.289, Top 4.22, Overdrive third 4.717, Third 5.877, Second 9.038, First 14.158, Reverse 15.07. UNITARY CONSTRUCTION of chassis and body gives exceptional strength rigidity, with low floor and deep rear foot wells. 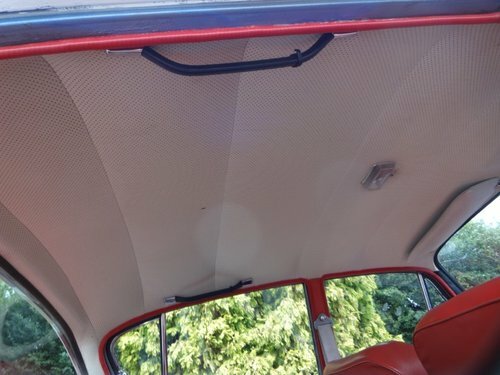 Underframe treated for sound deading. FRONT SUSPENSION: Fully-independent employing coil springs and swinging links. Suspension control by telescopic shock absorbers housed neatly down the centre of each coil spring. A torsion bar sway eliminator is fitted between lower links to assist ride control. There are no greasing points. REAR SUSPENSION: Semi-elliptic leaf springs with doubleacting telescopic shock absorbers maintain adeuate control under all conditions. WHEELS: Pressed steel wheels with ventilation slots and wide base rims. Four-wheels are embellished with chrome nave plates and wheel trim disc as standard. Spare wheel is housed in a cradle below luggage compartment. TYRES: Dunlop tubeless low profile nylon cord, 6.00 x 13 in. BRAKES: Lockheed 10.3 in. diameter disc brakes at front, and 9 in. diameter drum brakes at rear. Vacuum servoassisted requiring light pedal pressure. Handbrake at driver’s side operates independently through cable system on rear wheels. STEERING: Burman re-circulating ball type. Three-piece symmetrical track-rod linkage, with nylon inserts and sealed ball joints to eliminate lubrication points. Two spoke, 16 in. diameter adjustable telescopic steering wheel with chromium horn ring. PETROL TANK: 10 1/2 gallon capacity, positioned in left-hand rear wing. Lockable filler on top of wing. INSTUMENTS: Speedmeter including mileage and trip recorder, revolition counter, water temperature gauge, ammeter, fuel and oil pressure gauges. Warning lights for headlamp main beam, ignition, flashing indicators. STANDARD EQUIPMENT: Heater and ventilation system, screen washer, clock, cigarette lighter, padded interior sun visors, arm-rests on passenger doors, overriders, headlamp flasher, childproof door locks, boat floor carpet, reversing lamps, amber flashing indicators, overdrive unit, and fully reclining front seats. 35 amp alternator. MAIN DIMENSIONS: Overall length 13ft. 11in. overall width 5ft. 3 3/4 in. overall hight 4ft. 9 in.